A brand new omnibus of 55 short stories, presented for the first time in chronological order. Described by her friend Dolly Bantry as ? the typical old maid of fiction?, Miss Marple has lived almost her entire life in the sleepy hamlet of St Mary Mead. Yet, by observing village life she has gained an unparalleled insight into human nature ? and used it to devasting effect. As her friend Sir Henry Clithering, the ex-Commissioner of Scotland Yard has been heard to say: ?She?s just the finest detective God ever made.? ? and many Agatha Christie fans would agree. Appearing for the first time in The Murder at The Vicarage (1930) her crime-fighting career spanned over forty years when she solved her final case in 1977 in Sleeping Murder. With every tale flawlessly plotted by the Queen of Crime herself, these short stories provide a feast for hardened Agatha Christie addicts as well as those who have grown to love the detective through her many film and television appearances. Here, for the first time, more than 50 of Agatha Christie?s mini masterpieces have been collected together in one volume, perfectly illustrating the true breadth of her talent. 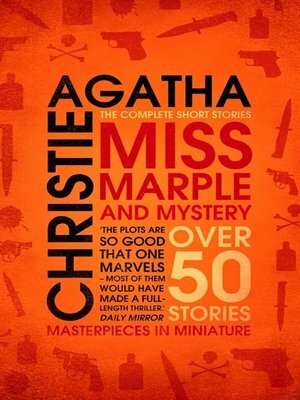 As well as every story featuring Miss Marple, the book includes additional stand-alone tales, from macabre tales of the supernatural, through suspense-ridden mysteries, to heart-stopping cases of murder.